Named after renowned Dutch architect, Hendrik Berlage, the Hendrik Collection is a gorgeous family of contemporary fixtures that honor the man who was regarded by many as the in.Father of Modern architecturein.. Much like Berlage himself, The Hendrik Collection is regarded as an intermediary between modern and traditional styles and is now suited for your bathroom. Classic lines are enhanced with a soft touch of current style cues to work in a number of aesthetic environments. The antique look provided by our Olde Bronze finish is partnered with the etched umber glass for a fantastic warm and frosted color palate. The 3-light wall sconce uses a 100-watt (max.) bulb and measures 24in. wide by 8in. high. This fixture may be installed with the glass up or down and is U.L. listed for damp location. Classic lines enhanced with a soft touch of current style (brushed nickel shown; view larger). 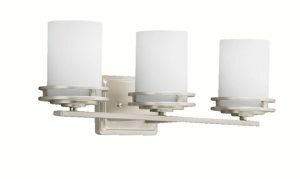 Named after renowned Dutch architect, Hendrik Berlage, the Hendrik collection is a gorgeous family of contemporary fixtures that honor the man who was regarded by many as the father of modern architecture. This Kichler Hendrik 24-inch bath light in olde bronze (model 5078OZ) features classic lines that are enhanced with a soft touch of current style cues to work in a wide range of decor. Present a unified look throughout your home with the simple yet sophisticated lines of the Hendrik ceiling fan complement the entire Hendrik collection, which includes a variety of indoor and outdoor lighting fixtures. The olde bronze finish is partnered with a light umber-etched cylindrical glass shade for a perfect balance of style and uncluttered design. The 5078OZ measures 24 inches wide with a body height of 7-1/2 inches. It uses three A19, 100-watt bulbs (maximum) that are dimmable, allowing for a gentle cascade of light or bright, pleasant illumination. You can also use 18-25-watt compact fluorescent (CFL) bulbs. The backplate measures 6-1/2 by 4-1/2 inches, held to the junction box by two decorative brushed nickel screw-on ball caps, and it comes with 5-3/4 inches of extra lead wire. This fixture can be installed with the glass up or down. Bath lights provide great general illumination in the bathroom and often work well in conjunction with ceiling lighting. Of course, they are also perfect task lighting for the activities you do in front of the mirror. Many bath lights can be installed with the glass pointing up or down, so your design possibilities are broader than they appear. Offering a distinctive array of solutions that reflect your individual personality, tastes, and plans, Kichler brings you an unparalleled variety of exciting style families, unique finishes, fresh colors and unequaled quality. Simply select a style and then choose among the many fixtures — from chandeliers and Chandelettes to wall sconces and ceiling mounts along with matching ceiling fans — all provided within the very same distinctive family collection. Family owned and operated since 1938, Kichler is a five-time winner of the prestigious ARTS Award and is a leader in energy-efficient technology. Seller warrants the products it provides will be free from defects in material and workmanship for 1 (one) year following the date of shipment from seller. If any of the warranted products are found by seller to be defective, such products will, at seller’s sole option and cost, be replaced, repaired or refunded less an amount directly attributable to consumer’s prior use of the product. The parties hereto expressly agree that buyer’s sole and exclusive remedy against the seller shall be for the repair, replacement, or refund of defective products as provided herein. This warranty is not transferable whether to heirs, subsequent owners, or otherwise. This warranty does not cover labor or other costs or expenses to remove or install any defective, repaired or replaced product. Goods which may be sold by seller but which are not manufactured by seller are not warranted by seller, but are sold only with the warranties, if any, of the manufacturers thereof. Seller’s warranty does not apply to any products that have been subjected to misuse, mishandling, misapplication, connected voltage at more than 5 percent above standard north american voltage, neglect (including but not limited to improper maintenance), accident, improper installation, improper packaging of products returned to kichler, modification (including but not limited to use of unauthorized parts or attachments), or adjustment or repair. At kichler’s request, buyer will send f. O. B. Destination any allegedly defective parts or products to the plant designated by kichler with proof of purchase, buyer’s name, return address, and a description of the claimed product defect. No affirmation of seller, by words or action, other than as set forth herein shall constitute a warranty. This light is very nice. Matches the bathroom design. My wife is very happy. The light is heavy weight and not a cheap light weigh material. We have gotten many “I love the light” compliments. You can mount / hang it with globes up or down. Take a look at the picture. I rely on reviews from others in the Amazon community, and hope this review has been helpful to you, if so please click the button below to let me know. Thank you! Purchased the chrome 5 light – planned on mounting it in the down position, but most of the light fixtures leaned inwards, making the all of the glass fixtures appear crooked. Decided to try the fixture in the up position, and it seemed to look ok. ALSO, two of the chrome circular pieces were slightly bent, AND a couple of the light bulb receptacles were bent. I wasnât expecting this low of quality for a $400 KICHLER fixture. After a few adjustments, the fixture is close to perfect. With the right bulbs, the fixture and light has completely changed the look of our master bath. Undecided if Iâd purchase again – wouldâve returned, but I had already disposed of the box and packaging. beautiful lights, though pricey! It is quite heavy. lights have different light output so I had to switch the shades to get the two lights to match- one is lighter than the other, I guess it is the frosted glass having a different frost, but very pleased with it, especially with the 75 watt Cree LED light bulb. Very bright. Here is a total of 32 watts shining brighter than the previous 360 watts of the previous six incandescent bulbs. Very nice fixture. Installs like most fixtures, quality is good. I have mine with the shades facing down. 3-40 watt equivalent LED sparkle bulbs give off a very nice warm light. Though not very bright due to the shades on the fixture. These Kichler fixtures are a bit on the expensive side. Not sure that they deserve to be. But, they are better than any fixtures that I could find at the local big box store. I will probably buy more Kichler fixtures for other rooms to match this elegant lamp. 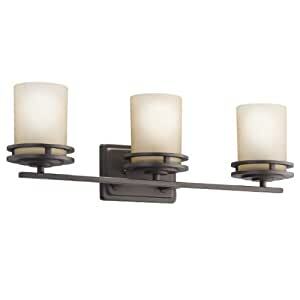 We used this fixture when renovating our master bath. With 500 watts of light (using much less power with CFLs) it lights up a 150 sq ft bathroom with no problems. Just make sure you’re very precise with installing the base plate to ensure that it’s level, and the installation is no big deal. Total install time was about 30 minutes. Bought three. Pretty and functional. One came slightly bent which went unnoticed until after installation. Look closely if you buy. The glass cover is also a bit too short. I had a bit of an issue finding LED bulbs that fit and were the wattage I wanted. Love this light fixture. It is very heavy so make sure you have it supported for that weight. You can hang it up or down.